18:1 Then the whole congregation of the people of Israel assembled at Shiloh and set up the tent of meeting there. The land lay subdued before them. 11 The lot of the tribe of the people of Benjamin according to its clans came up, and the territory allotted to it fell between the people of Judah and the people of Joseph. 12 On the north side their boundary began at the Jordan. Then the boundary goes up to the shoulder north of Jericho, then up through the hill country westward, and it ends at the wilderness of Beth-aven. 13 From there the boundary passes along southward in the direction of Luz, to the shoulder of Luz (that is, Bethel), then the boundary goes down to Ataroth-addar, on the mountain that lies south of Lower Beth-horon. 14 Then the boundary goes in another direction, turning on the western side southward from the mountain that lies to the south, opposite Beth-horon, and it ends at Kiriath-baal (that is, Kiriath-jearim), a city belonging to the people of Judah. This forms the western side. 15 And the southern side begins at the outskirts of Kiriath-jearim. And the boundary goes from there to Ephron, to the spring of the waters of Nephtoah. 16 Then the boundary goes down to the border of the mountain that overlooks the Valley of the Son of Hinnom, which is at the north end of the Valley of Rephaim. And it then goes down the Valley of Hinnom, south of the shoulder of the Jebusites, and downward to En-rogel. 17 Then it bends in a northerly direction going on to En-shemesh, and from there goes to Geliloth, which is opposite the ascent of Adummim. Then it goes down to the stone of Bohan the son of Reuben, 18 and passing on to the north of the shoulder of Beth-arabah it goes down to the Arabah. 19 Then the boundary passes on to the north of the shoulder of Beth-hoglah. And the boundary ends at the northern bay of the Salt Sea, at the south end of the Jordan: this is the southern border. 20 The Jordan forms its boundary on the eastern side. This is the inheritance of the people of Benjamin, according to their clans, boundary by boundary all around. 21 Now the cities of the tribe of the people of Benjamin according to their clans were Jericho, Beth-hoglah, Emek-keziz, 22 Beth-arabah, Zemaraim, Bethel, 23 Avvim, Parah, Ophrah, 24 Chephar-ammoni, Ophni, Geba—twelve cities with their villages: 25 Gibeon, Ramah, Beeroth, 26 Mizpeh, Chephirah, Mozah, 27 Rekem, Irpeel, Taralah, 28 Zela, Haeleph, Jebus (that is, Jerusalem), Gibeah and Kiriath-jearim—fourteen cities with their villages. This is the inheritance of the people of Benjamin according to its clans. 1And the whole congregation of the children of Israel assembled together at Shiloh, and set up the tabernacle of the congregation there. And the land was subdued before them.2And there remained among the children of Israel seven tribes, which had not yet received their inheritance.3And Joshua said unto the children of Israel, How long are ye slack to go to possess the land, which the LORD God of your fathers hath given you?4Give out from among you three men for each tribe: and I will send them, and they shall rise, and go through the land, and describe it according to the inheritance of them; and they shall come again to me.5And they shall divide it into seven parts: Judah shall abide in their coast on the south, and the house of Joseph shall abide in their coasts on the north.6Ye shall therefore describe the land into seven parts, and bring the description hither to me, that I may cast lots for you here before the LORD our God.7But the Levites have no part among you; for the priesthood of the LORD is their inheritance: and Gad, and Reuben, and half the tribe of Manasseh, have received their inheritance beyond Jordan on the east, which Moses the servant of the LORD gave them.8And the men arose, and went away: and Joshua charged them that went to describe the land, saying, Go and walk through the land, and describe it, and come again to me, that I may here cast lots for you before the LORD in Shiloh.9And the men went and passed through the land, and described it by cities into seven parts in a book, and came again to Joshua to the host at Shiloh.10And Joshua cast lots for them in Shiloh before the LORD: and there Joshua divided the land unto the children of Israel according to their divisions.11And the lot of the tribe of the children of Benjamin came up according to their families: and the coast of their lot came forth between the children of Judah and the children of Joseph.12And their border on the north side was from Jordan; and the border went up to the side of Jericho on the north side, and went up through the mountains westward; and the goings out thereof were at the wilderness of Bethaven.13And the border went over from thence toward Luz, to the side of Luz, which is Bethel, southward; and the border descended to Atarothadar, near the hill that lieth on the south side of the nether Bethhoron.14And the border was drawn thence, and compassed the corner of the sea southward, from the hill that lieth before Bethhoron southward; and the goings out thereof were at Kirjathbaal, which is Kirjathjearim, a city of the children of Judah: this was the west quarter.15And the south quarter was from the end of Kirjathjearim, and the border went out on the west, and went out to the well of waters of Nephtoah:16And the border came down to the end of the mountain that lieth before the valley of the son of Hinnom, and which is in the valley of the giants on the north, and descended to the valley of Hinnom, to the side of Jebusi on the south, and descended to Enrogel,17And was drawn from the north, and went forth to Enshemesh, and went forth toward Geliloth, which is over against the going up of Adummim, and descended to the stone of Bohan the son of Reuben,18And passed along toward the side over against Arabah northward, and went down unto Arabah:19And the border passed along to the side of Bethhoglah northward: and the outgoings of the border were at the north bay of the salt sea at the south end of Jordan: this was the south coast.20And Jordan was the border of it on the east side. This was the inheritance of the children of Benjamin, by the coasts thereof round about, according to their families.21Now the cities of the tribe of the children of Benjamin according to their families were Jericho, and Bethhoglah, and the valley of Keziz.22And Betharabah, and Zemaraim, and Bethel,23And Avim, and Parah, and Ophrah,24And Chepharhaammonai, and Ophni, and Gaba; twelve cities with their villages:25Gibeon, and Ramah, and Beeroth,26And Mizpeh, and Chephirah, and Mozah,27And Rekem, and Irpeel, and Taralah,28And Zelah, Eleph, and Jebusi, which is Jerusalem, Gibeath, and Kirjath; fourteen cities with their villages. This is the inheritance of the children of Benjamin according to their families. Why did Joshua send people out to write a description of the land? 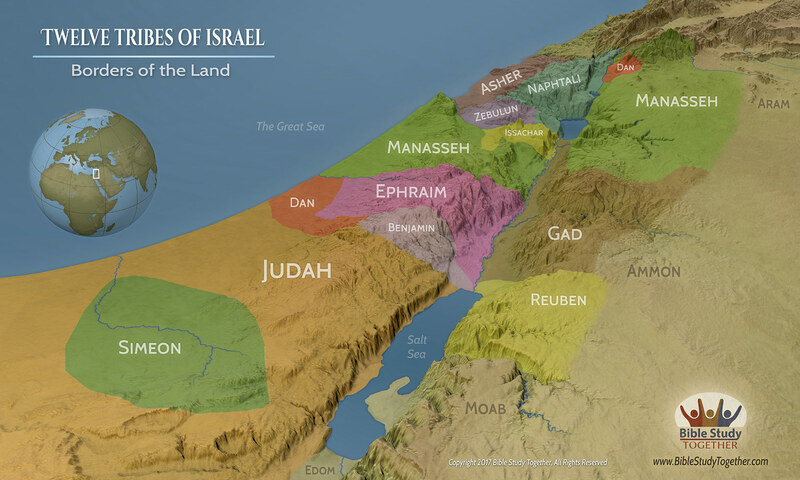 How did Joshua determine the inheritance of the remaining tribes? What have you been putting off that you know you should do? Which tribes did not put off taking possession of their inheritance? Encourage someone to not put off till tomorrow what they can do today.